Credit booms have often financed rapid investment growth, with investment subsequently stalling (Mendoza and Terrones 2012, Gorton and Ordonez 2016). However, after the Global Crisis, the nature of the relationship between credit and investment has changed. Specifically, credit to the nonfinancial private sector has risen rapidly in several several emerging market and developing economies (EMDEs), while investment growth has slowed (Kose et al. 2017, Caballero et al. 2016). Against this background, we address three questions: How has investment evolved during credit booms and deleveraging episodes in EMDEs? How often have credit booms been accompanied by investment booms? And finally, how has output growth has evolved over the credit cycle? To answer these questions, we focus on credit to the non-financial private sector, which consists of claims – including loans and debt securities – on households and non-financial corporations by the domestic financial system as well as external creditors. Following Ohnsorge and Yu (2016), a credit boom is defined as an episode during which the private sector credit-to-GDP ratio is more than 1.65 standard deviations above its Hodrick-Prescott filtered trend in at least one year. Conversely, a deleveraging episode is an episode during which the private sector credit-to-GDP ratio is more than 1.65 standard deviations below trend in at least one year. While a boom peaks when the credit-to-GDP ratio begins to fall, a deleveraging episode reaches its trough when the credit-to-GDP ratio starts to climb. Credit booms have typically been associated with rising investment (Mendoza and Terrones 2008 and 2012, Elekdag and Wu 2013). During the median credit boom over the past two to three decades, real investment grew by 1% of GDP above its long-term trend until the peak of the credit boom (World Bank 2017). This was often followed by a correction – for a quarter of pre-crisis credit booms, the real investment-to-GDP ratio dropped about 2% below its long-term trend over the two years after the peak. In the most severe credit boom-and-bust episodes, investment swung sharply. For example, during the Asian financial crisis of the late 1990s, in the median affected EMDE, investment contracted by 3% of GDP in 1998 and by 5.6% of GDP in 1999. Similarly, investment growth slowed during deleveraging episodes. Real investment dropped below its long-term trend by about 2% of GDP during the last three years of a median deleveraging episode (World Bank 2017). After the trough of a typical deleveraging episode, real investment rebounded above its trend within three years. Although investment growth tended to rise during credit booms, not all credit booms were associated with investment booms. For instance, Mendoza and Terrones (2012) document that the coincidence between investment booms and credit booms in EMDEs was about 34%. The moderate coincidence of credit booms and investment booms may reflect credit booms that mainly fuelled consumption (Elekdag and Wu 2013). To study the coincidence between credit booms and investment surges, we follow former studies and define investment surges as years when the investment-to-GDP ratio is at least one (1.65 for investment booms) standard deviation higher than its Hodrick-Prescott filtered trend. 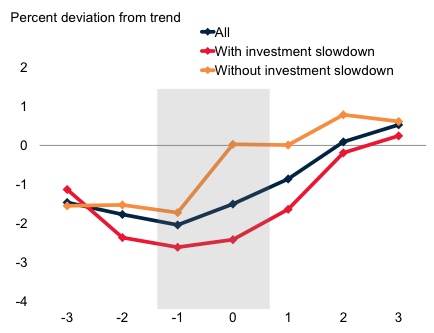 Similarly, investment slowdowns are defined as years in which the investment-to-GDP ratio is at least one standard deviation below its Hodrick-Prescott filtered trend. Investment surges in advanced economies coincided with credit booms more often than in EMDEs (World Bank 2017). 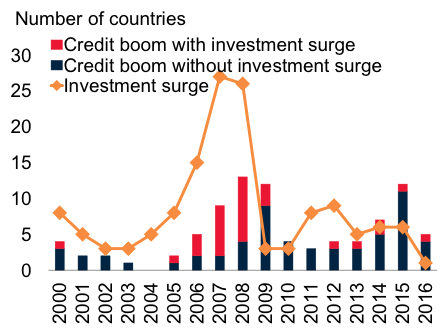 But even in EMDEs, more than 30% of credit booms were accompanied by investment surges during the peak year of a credit boom (Figure 1A). Of these investment surges that coincided with credit booms during the peak year, two-thirds were sufficiently strong to qualify as investment booms in advanced economies, and about half qualified as investment booms in EMDEs. Notes. Shows the percent of credit booms with investment surges/booms during the peak year. For details, see World Bank (2017). Source: Haver Analytics; International Financial Statistics, International Monetary Fund; World Economic Outlook, International Monetary Fund; Bank for International Settlements; World Development Indicators, World Bank. After the Global Crisis, the coincidence between credit booms and investment surges dropped significantly (Figure 1B). 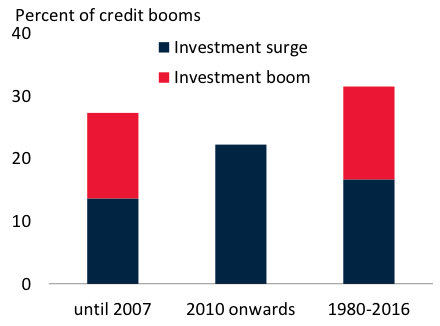 In 2007-08, most EMDEs in a credit boom were also in an investment surge. However, from 2010 onwards, hardly any EMDEs were both in a credit boom and an investment surge. During 2010-16, 22 EMDEs were at some point in a credit boom, but the credit boom was accompanied by an investment surge in only five EMDEs (Bangladesh, Colombia, Kenya, Mongolia, and Philippines). By 2016, these post-crisis credit booms had unwound in all but five countries (Bolivia, China, Georgia, Philippines, and Qatar). In several countries, rapid credit growth fuelled above-average consumption growth (Bolivia, India, and Ghana) rather than an investment surge. During the period between 2012 and 2015, consumption in EMDEs was about 0.5% of GDP above trend, near or above its median expansion during past credit booms (World Bank 2017). An accompanying investment boom reduces the output losses when a credit boom unwinds. In general, output expanded during credit booms, but by less than investment (Mendoza and Terrones 2012). Before the median credit boom peaked, output increased, on average, by about 3% above trend in cases where there was an investment surge and by about 1% above trend in cases where there was no investment surge (Figure 2A). 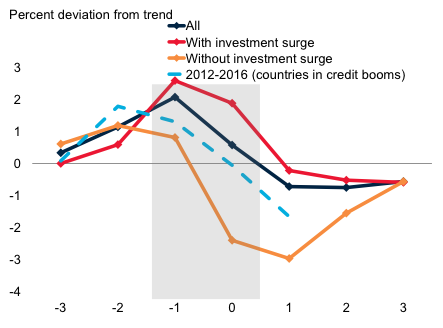 As credit booms unwound from their peaks, output dropped below trend by more than 2% over two years in the absence of investment surges, but by less than half as much when there were investment surges. The more disruptive unwinding of credit booms without investment surges may reflect the lack of a boost to potential output from capital accumulation that could be provided by an investment surge. In the recent wave of credit surges since 2012, EMDE output has evolved similarly to that of past credit booms without investment surges. Notes. For details, see World Bank 2017. A. The mean cyclical components of GDP in percent of its HP-filtered trend for the twelve countries in credit booms in 2015 during 2012-2016 are in light blue dashed line. Source: Haver Analytics; International Financial Statistics, International Monetary Fund; Bank for International Settlements; World Development Indicators, World Bank. During the median deleveraging episode, output fell by almost 2% below trend (Figure 2B). If accompanied by an investment slowdown, the decline in output was sharper as output fell from about 1% below trend in the run-up to the deleveraging to about 3% below trend around its trough. It took about three years for output to move back to its trend after a deleveraging episode. Since 2010, several EMDEs have experienced rapid private sector credit growth. In contrast to many pre-crisis episodes, however, these credit booms have typically not been accompanied by investment surges. Output growth during the most recent credit booms has also been lower than in previous episodes. The lack of rapid investment growth during these post-crisis credit booms may signal sharper output corrections once these credit booms subside. In past credit booms, output has contracted more when credit booms unwound that had occurred without investments surges. Caballero, J, U Panizza, and A Powell (2016), “Foreign Currency Corporate Debt in Emerging Economies: Where Are the Risks?”, VoxEU.org. Elekdag, S, and Y Wu (2013), “Rapid Credit Growth in Emerging Markets: Boon or Boom-Bust?”, Emerging Markets Finance and Trade 49 (5): 45-62. Gorton, G, and G Ordonez (2016), “Good Booms, Bad Booms: Why Only Some Credit Booms End in a Crisis”, VoxEU.org. Kose, M A, and F Ohnsorge, and L S Ye (2017), “Sluggish Investment: A Persistent Headache?”, VoxEU.org. Mendoza, E, and M E Terrones (2008), “An Anatomy of Credits Booms: Evidence from Macro Aggregates and Micro Data”, NBER Working Paper 14049. Mendoza, E, and M E Terrones (2012), “An Anatomy of Credits Booms and their Demise”, Journal Economia Chilena 15 (2): 04-32. Ohnsorge, F, and S Yu (2016), “Recent Credit Surge in Historical Context”, Policy Research Working Paper 7704, World Bank, Washington, DC. World Bank (2017), Weak Investment in Uncertain Times: Global Economic Prospects January 2017, Washington, DC: World Bank.